Yesterday I just so happened to share a picture of my dad and me on Instagram. It's one of about six photos I have with him. 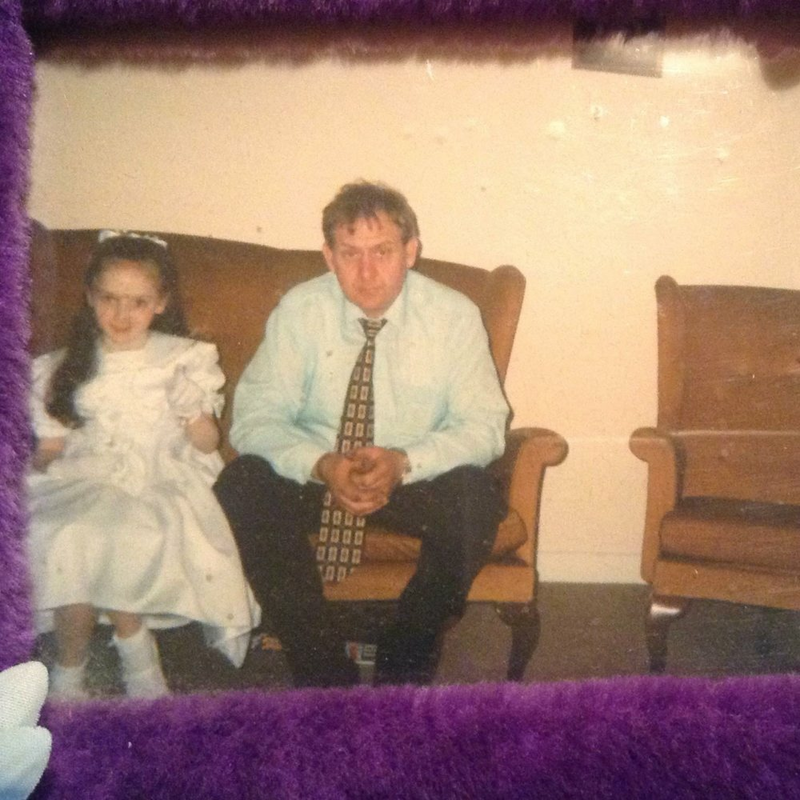 This particular one was was taken on May 25, 1997 on the day I made my First Communion. We are sitting in the front room of the house, the good room or Santa's room as it was called from time to time, because it was also the room where we kept the Christmas tree. My Dad really liked Christmas or so my Mom tells me. I have a vivid memory of one of my brothers, my mom and myself decorating the tree the Christmas my father died. He was sitting proudly watching us and he mentioned how good I had been in the annual school play which had taken place days before. It's bizarre now to think that a week or so later he would be dead with absolutely no warning. That was almost eighteen years ago. Christmas Eve,or Christmas in general,has never been the same, nor will it be. My birthday falls on December 21st and my Dad's anniversary follows three days after. It's a strange time of year for me. Even though all that time has passed it can still knock the wind out of me at any given moment. Sparked by the most unpredictable things. A situation where I just need advice. When my car breaks down and I remember all the times I watched him fix other people’s cars, but he never got to fix mine.A bad day at work or a good day—any day. Then of course there are the predictable incidents where it stings like no other feeling. A friend’s wedding when the father proudly speaks about his daughter, a song from a band he used to like, passing the garage where he worked. The countless life events that he should be here to see and experience. I could talk all day about grief but I don't want to go on too long. I want this piece to be concise. There are no two ways about it. Grief changes you. It alters your perception of life. You simply cannot imagine the pain and emotion felt of someone grieving unless you have experienced it yourself. Others will mean well when they console you, they'll sympathise with you and for a while there will be a fuss, sometimes suffocatingly so. Then there will be silence, the phone calls will fade and people will get on with their lives and so will you. That is the difficult part. Getting on with what has to be your new normal. That is a difficult transition that seems impossible and then you take one breath by breath, one hour by hour, day by day, week by week, year by year and one day you find yourself eighteen years down the line wondering how you got there. I captioned the post on Instagram - "I think we could have clashed because I got my temper from him but there are days when I would give anything just to find out." Louise O'Sullivan is a writer from Cork, Ireland. Although she has always been drawn to writing since her primary school days her light bulb moment that she wanted to pursue writing more seriously came at the age of 27. Not fitting into any one particular genre, Louise is mainly drawn to writing from experience with a particular attraction to memoir and more recently poetry. Louise has written freelance for the Evening Echo (a Cork based newspaper) as well as being published in the Migraine Association of Ireland's magazine, Brainstorm. In addition, Louise has been published on numerous websites such as A Lust for Life and Writing.